Plot: Laura, a Spanish woman living in Buenos Aires, returns to her hometown outside Madrid with her two children to attend her sister's wedding. However, the trip is upset by unexpected events that bring secrets into the open. 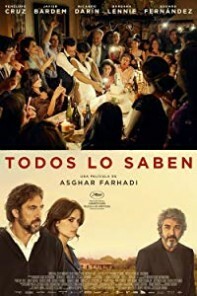 Starring: Penélope Cruz, Javier Bardem, Ricardo Darín, Eduard Fernández. distributed by Focus Features «Everybody Knows» in the US movie theaters released on February 8, 2019 and has grossed over $18 million worldwide; dvd and blu-ray release date was set for May 7, 2019. Rent from Netflix and Redbox from May 7, 2019. «Everybody Knows» in the UK released in movie theaters on March 8, 2019. DVD and blu-ray release date scheduled for July 15, 2019.